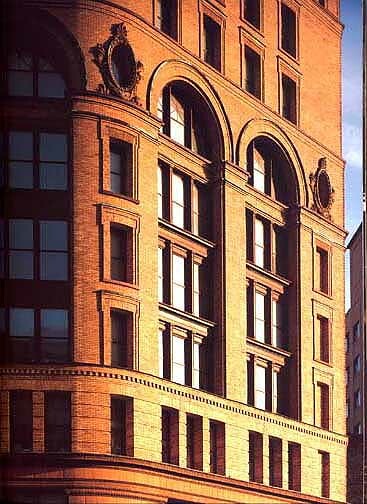 Dun Building (1894-1895),110 Pearl Street, was designed by E. B. Green and William S. Wicks, who applied the Neoclassical style of horizontal buildings to a vertical tower, so the facade is divided into a series of multiple-story bands stacked one on top of the other, The central band shown here features giant four-story window arches, decoratively framed oval windows on the seventh floor, and other architectural details that are more interesting than those on the bands below and above it. Although the building has a supporting steel skeleton, the walls also had to be made load -bearing to give the very narrow structure more bracing against the strong winds off Lake Erie. The building was named for the R. G. Dun Company, which later became Dun and Bradstreet. At 10 stories, it was the first Buffalo highrise.